Another barn find of a different sort. Found this Clausing Model 4805 Lathe covered up outside a Gulf gas station in Patterson NJ. The station owner bought the lathe a year ago and immediately dropped it of it's face breaking off the cast iron tumbler lever. He lost interest, covered it up with a tarp, and forgot about it for a year until I started to poke around. 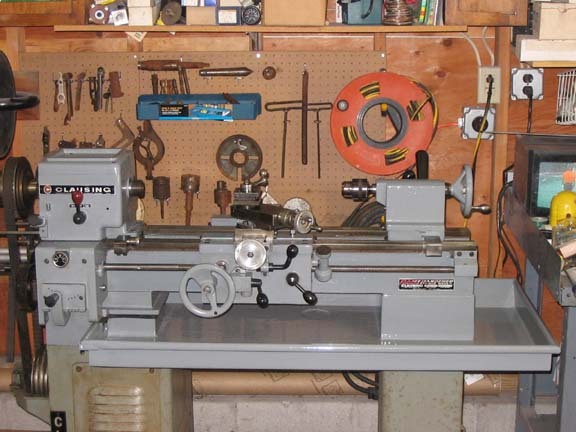 He said he paid $1500 for the lathe, but that was when it was in good working order and not covered in rust. He held fast at $1000, but after a few weeks, I took it home for $500. It just doesn't get any better than this. While the outside looked in sad shape, the internal gears and motor was like new. But a full overhaul is in order. Closer inspection found the only damage to be two bent shafts on the compound and of course the broken tumbler lever. The bent shafts operated the X and Y axis on the compound and were easily straighten out once I got the shaft out, getting them out was not so easy. Now to learn cast iron welding to repair the lever. Used Muratic acid to start de-rusting the parts by brushing, and brushing, and brushing. The rust finally dissolved leaving a grey phosphoric residue which wiped right off with acetone and scothbrite pads.